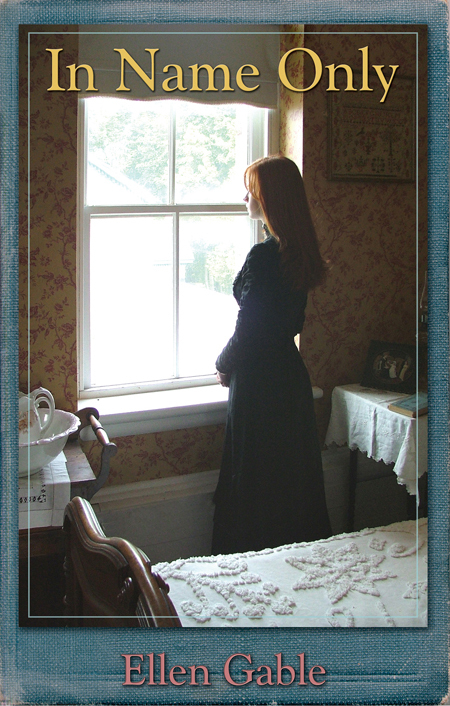 Set in Iowa, the novel begins with Danny waking up to a woman, dressed in white, who kisses him. 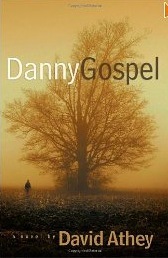 For the rest of the book, while he searches for this mysterious girl, we learn about Danny’s tragic life, told in his own peculiar and unique way. Danny’s own words are “I’m always in mourning, even when I’m happy.” This should have been a depressing read. On the contrary. It is an incredibly uplifting story filled with humor and innocence, joy and hope. At one point, Danny is provoked into a fight and seriously harms someone and, although he wants to stay, his friend gives him money and a car to leave town. During his travels, Danny drives down to Florida. Eventually, though, he realizes he must return home to Iowa. In this economy, saving money has become a priority for most couples. It might seem like a simple concept, but Natural Family Planning is actually the cheapest method a couple can use for birth regulation. Depending on the course, fees vary from free to $150. If you add an extra $20 or so for thermometer replacement (for couples using the sympto-thermal method), it still brings the total to no more than $170 over the course of 30 years. Compare that to the cost of chemical methods (like the Pill, contraceptive patch) or expensive surgeries. Even devices such as condoms and diaphragms are expensive when you consider that a couple will be using them frequently over 30 years or so. Compare that also to the fact that most methods of contraception pose some risks to the users and those costs should also be factored in. 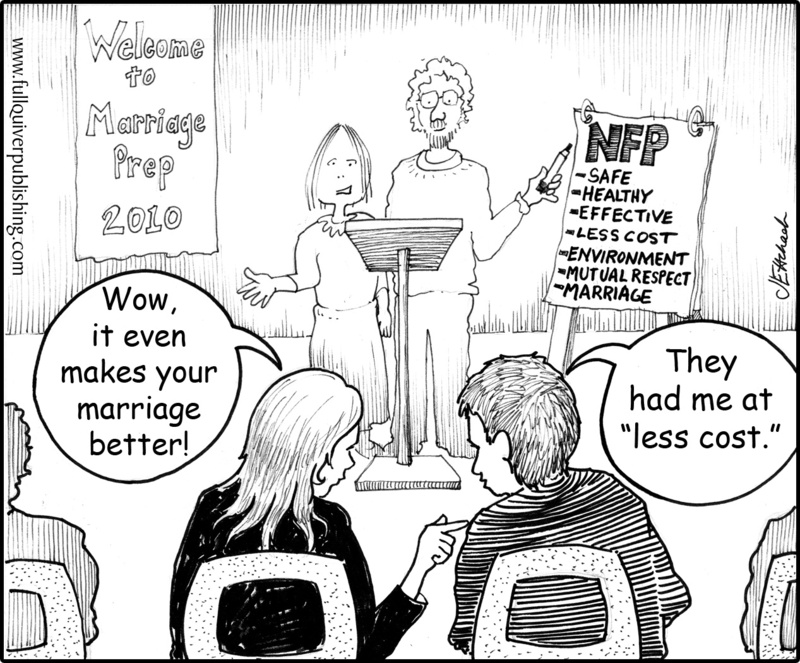 NFP is safe and healthy, with no side effects. While cost was not the reason we initially used NFP, it certainly has become a bonus for us. 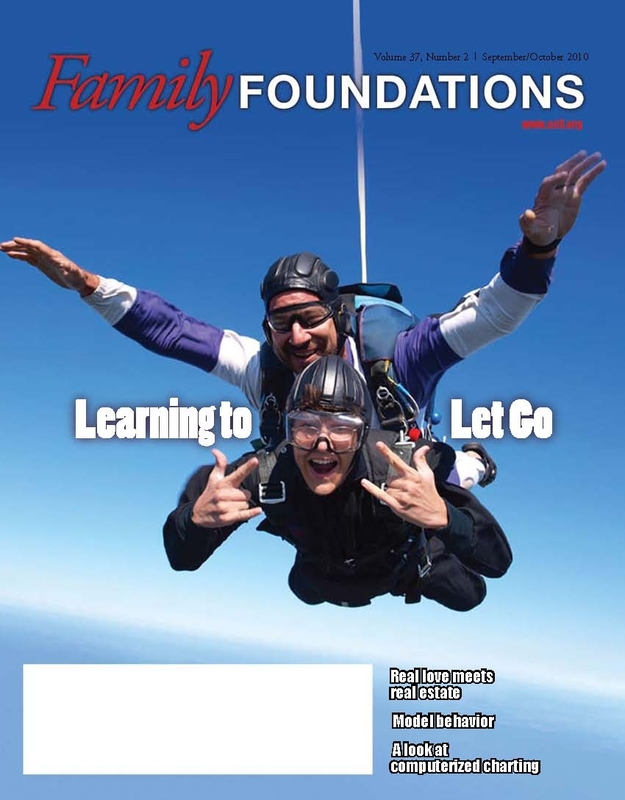 Couples can now learn NFP online anywhere in North America. For more information, leave a comment or email me at ellengablehrkach@gmail.com. 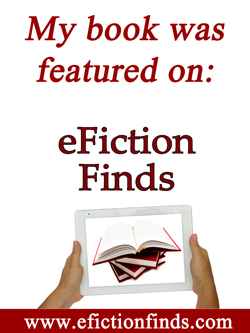 Note: Cartoon images are owned by Full Quiver Publishing and may not be used without permission. Last summer, Tim (then 17) landed a “dream” job at the local parachuting club. A few weeks after he had started, Tim called from the club and calmly explained that his boss had shared with him that one of the perks of his job was free skydiving. So he asked if he could go skydiving, that afternoon – in about two hours, to be precise. I immediately dismissed the request, saying, “Tim, forget it. You’re not jumping out of a plane at 10,000 feet.” I had spent the last 17 years of Tim’s life trying to protect him from danger, so why would I stop now? The instructor who made the tandem jump with Tim assured me that there were all kinds of backups and safety precautions: extra parachutes, an experienced jumper making the trip down with him, etc. But I was not happy about it. I prayed from the moment he stepped onto the airplane and continued praying. It was the longest 20 minutes of my life. My hands were shaking and I don’t think I actually breathed until he stepped onto the ground. When he was close to landing, we could hear him screaming. In that first half-second, my motherly instincts kicked in and I panicked. “Is he okay?” I frantically asked my husband, standing nearby. Then I heard loud hearty laughter from Tim, still in the air above us. I nodded, now relieved and happy that he was safe. Family Size, Who Should Decide? Sometime ago, I was admiring the newborn son of a young couple at our parish. An older woman from the parish approached the group of us and heard me say, “What a beautiful baby you have!” To which the older woman replied, “Ellie, don’t you get any ideas.” Generally speaking, I don’t take offense to comments like that, but it was the third time that month that people had taken it upon themselves to tell me that I shouldn’t get any ideas of having another baby. My somewhat belligerent personality wanted to respond: “At my age, if I get pregnant, it won’t be my idea, it’ll be God’s…” Instead, I kept quiet and laughed off the comment. In our modern secular society, many people seem to think that they have some sort of role in a couple’s intimate decision-making process of deciding whether to plan a pregnancy or avoid one. You’ve heard of the pesky grandmother nagging her kids to give her a grandchild or another grandmother telling her son and his wife that they have enough children and that they should “just stop.” Or the well-meaning relatives who don’t think you can “afford” another child. “It is Jesus that you seek when you dream of happiness; He is waiting for you when nothing else you find satisfies you; He is the beauty to which you are so attracted; it is He who provoked you with that thirst for fullness that will not let you settle for compromise; it is He who urges you to shed the masks of a false life: it is He who reads in your hearts your most genuine choices, the choices that others try to stifle.